The Buddy Rescue Foundation has rescued and supported many animals since its inception. We love to tell each of the stories about our rescued buddies, so please enjoy them and help us make a difference to more rescued buddies so we can tell their stories as well. Rosie is an ex-racing greyhound we took in without having first seen her, since we were told she was considered unadoptable due to the many scars on her ears, neck and body suffered during her 4-1/2 years racing at New England racetracks. When we picked up Rosie, all we saw were her beautiful eyes and spunky personality! Rosie has been retired now for eight years, racing now only to be the first on the couch! 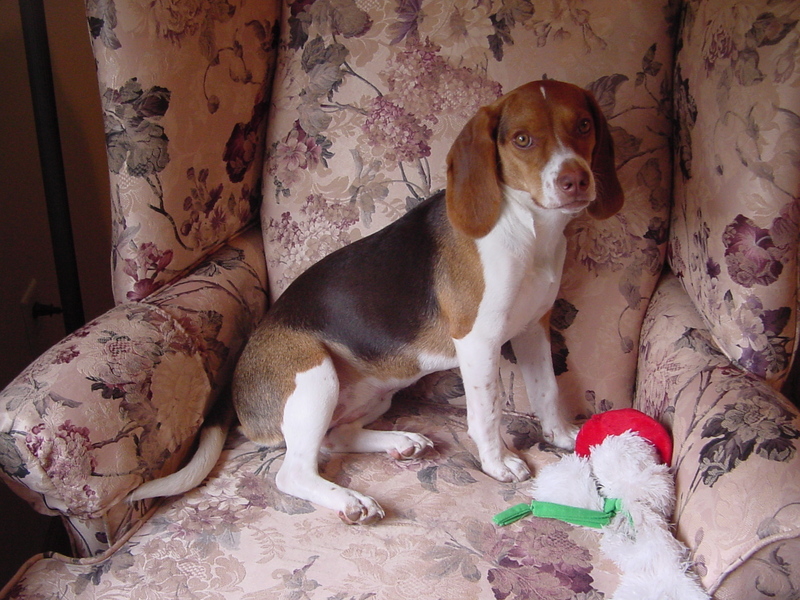 Penny, a 5-1/2 month beagle, arrived on a transport from a kill shelter in Kentucky. Within two days of arriving, she became extremely ill with pneumonia. We were advised that treatment would be costly and there were no guarantees she would survive, but she had already come a long way to get to us, so we opted to pursue treatment. After two weeks in the hospital and under quarantine for six more weeks, Penny slowly improved and is now a happy and healthy 3 year old. Sausage, like many cats, was left behind when his owner moved away. With so many cats available in the shelter system and the uncertain future he would face as an eight year old senior, we decided that he would remain with us to avoid the stress of relocating to a new home. Sausage now continues to spend his days exploring and protecting his territory and finding that perfect spot to nap on the hay bales in the barn! 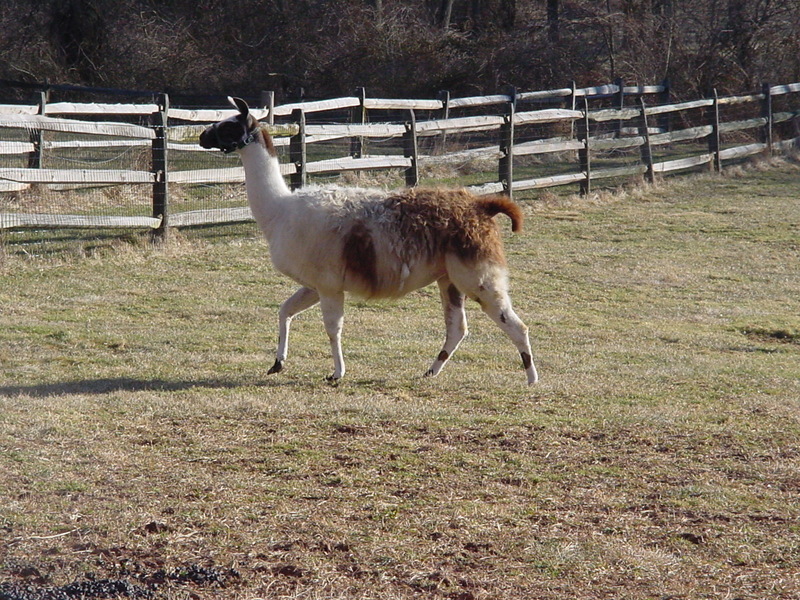 Cocoa, a 3-1/2 year old female llama, was on her way to auction after having been born and raised on the only farm she knew. Cocoa was brought to our attention and transported by a very caring individual who was just as touched by her story as we were. After the stress of the move, Cocoa settled right in and showed us what a sweet llama she is! Now she is content to graze in the pasture and relax in the sun. 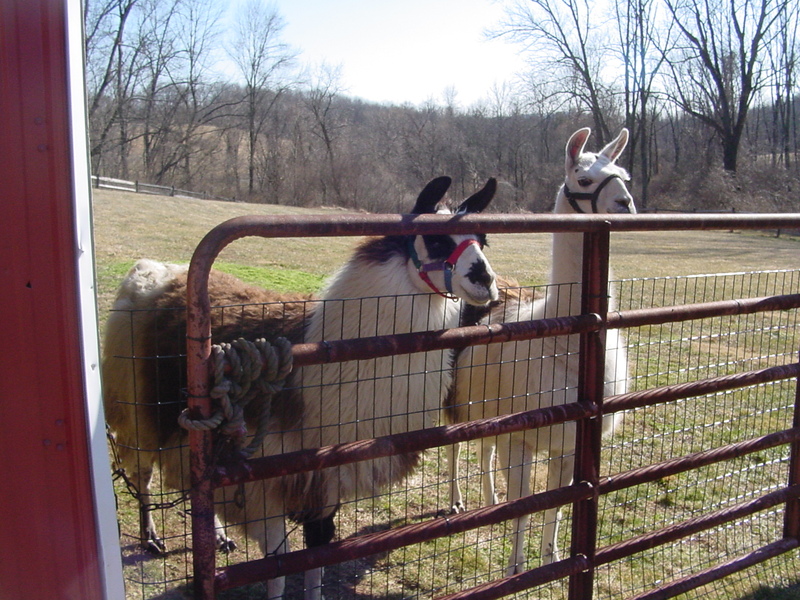 Cory, Comanche (pictured to the right) and Julie (pictured below) are a llama family. 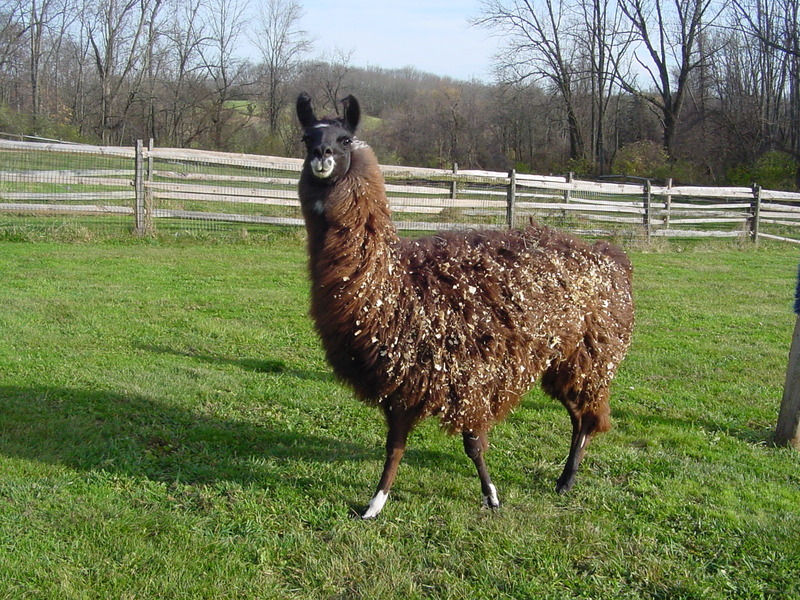 Comanche is the offspring of Julie and Cory, and all three lived with their owners all their lives. When their primary caregiver passed away and the property was put up for sale, the surviving owner reached out to find a suitable home so we placed them so that they could remain together to live out their lives. Jake is a mini-nubian goat wether, who is the ambassador of the seven mini-nubians in his herd, and a real sweetheart with anyone who visits. Jake developed bladder stones twice last year when he was just a year old, and we decided with both occurrences to pursue surgery to remove the stones rather than euthanasia. He will never be cured, but we support his medication protocols and dietary restrictions to try to prevent re-occurrence of the stones. Despite his health issues, Jake is a happy goat and never misses the opportunity to nibble on your jacket or sleeve if you're not looking. Amos, a 30+ year-old standardbred horse, arrived at the end of June 2010. 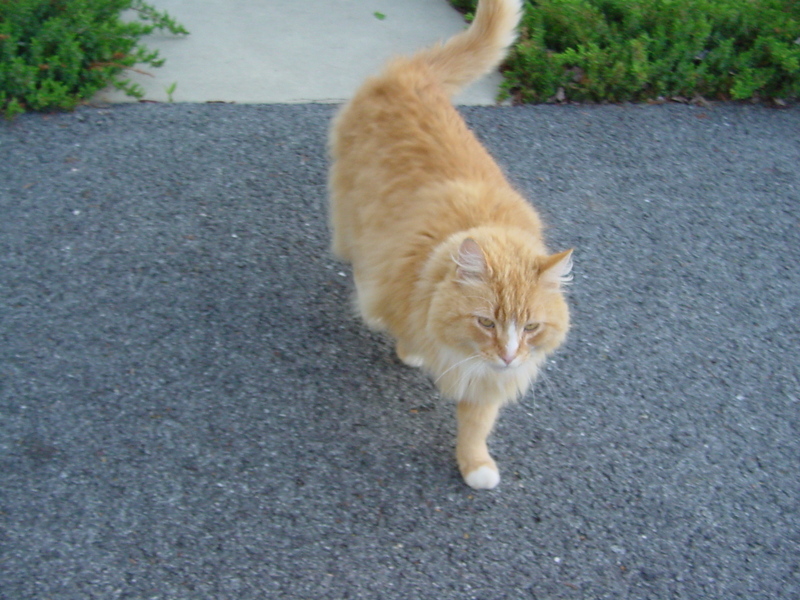 Despite his owner's best efforts to increase his feed, Amos had progressively lost weight to the point where he was too thin for his frame, as seen in the picture above. As a last effort to try to save him, we took him in so he would have pasture to graze, hoping this would stop the weight loss and prevent illness. 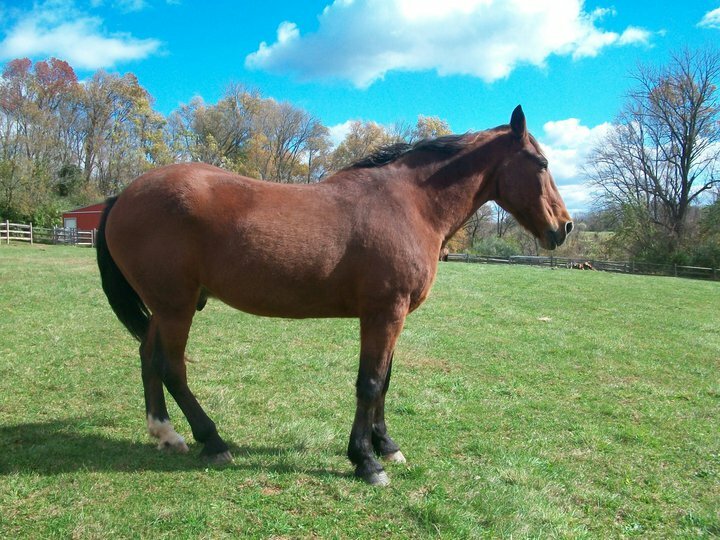 Amos took to the pasture so well that he quickly gained weight and as you can see from the picture to the right, he went into the winter a much stronger and healthier horse. Melvin, a 28+ year old Morgan pony, was underweight when he came here in October 2010. With the same feed and pasture regimen given to Amos, we were able to get Melvin to actually gain weight over this past extremely cold winter. What a nice surprise when his blankets came off! Melvin is a spirited pony, and we have no doubt that with continued focus on his feed, grazing and exercise, his weight will stabilize. UPDATE: This past year, Melvin was diagnosed with Cushings Disease, a metabolic disease that causes horses to be prone to laminitis. Melvin has had some lameness, but with medication and restricted diet, we have been able to keep him sound. On good days he can still buck like the show pony he used to be. Our past rescued buddies have passed on but have left their indelible mark on us and strengthen our commitment to honor them by saving others. Buddy was a stray we rescued right off the streets. He was a loving companion for eight years, sharing his sweet friendly nature with everyone along the way. We channelled our grief in losing Buddy to establish The Buddy Rescue Foundation, so we could save other animals in similar situations as Buddy, with no alternatives for a chance to live the rest of their lives, happy and healthy in a loving environment. 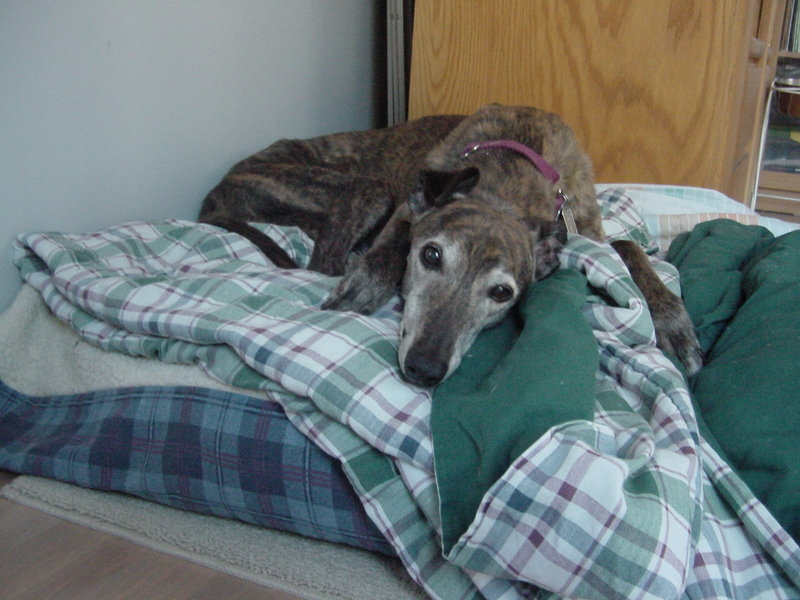 Honey (later named Jackie), a senior greyhound mix, had been abandoned and was suffering from some significant health issues when a number of caring people stepped in to transport her to us in NJ. Jackie was significantly underweight due to an underlying metabolic condition, and we worked with her vet to get her weight and health back on track. She improved for awhile and shared her sweet and graceful nature and even found her "bark" when she was with us, but in the end, despite her strong will, her condition could not be overcome. While we don't know how or when her journey began, she stole our hearts along the way and we are proud that her long road ended with us. 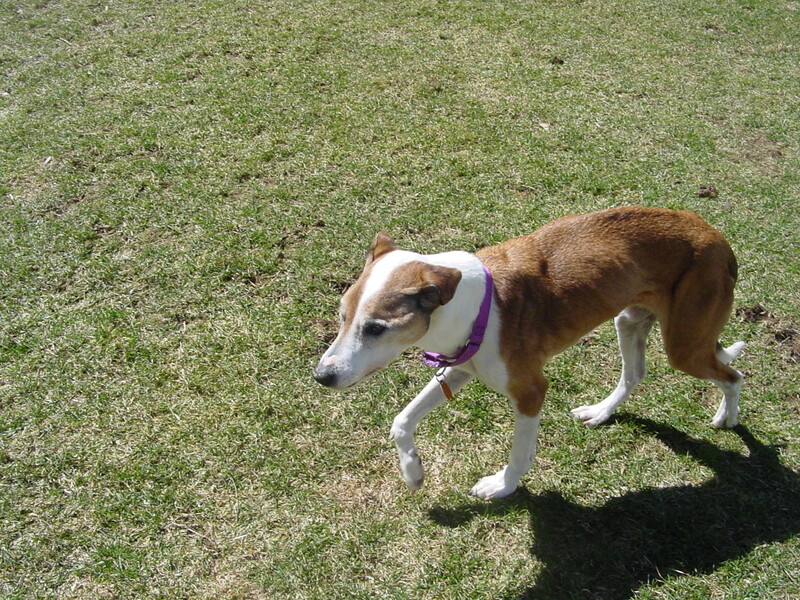 Cassie was left to family members of her elderly owner when he passed away. We "re-rescued" her at age 13 weighing just 27 lbs, with the hope to bring her dangerously frail body back to health. We were optimistic and overjoyed as her personality and spirit recovered, but her frail body was overwhelmed and she suffered a stroke and passed away. We are proud to have taken care of Cassie, on her way to reunite with her owner once again. Willie was surrendered when his owners had children, abandoning him after treating him like their only child for 8 years. Willie was completely blind and his story so moved us that we took him in so we could place him in a stable home environment. Willie was amazing in how he used his other senses to navigate his home and yard! We miss his spunky personality and endearing expressions, and hope he finally felt like he was home. 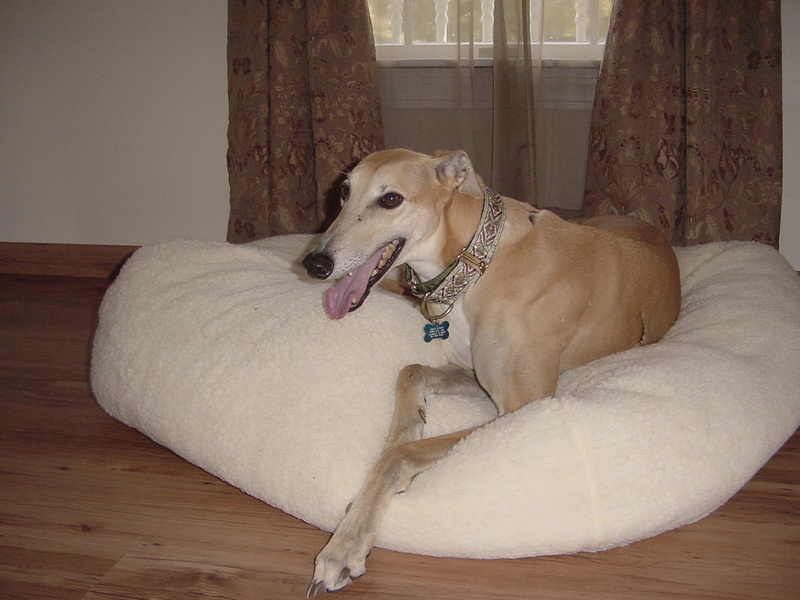 Casey, an eight year old ex-racing greyhound, was "re-rescued" from a family that had been keeping her confined to a bathroom in their home. She proved to be a loving and sweet girl, coming out of her shell once the stress was removed from her life. 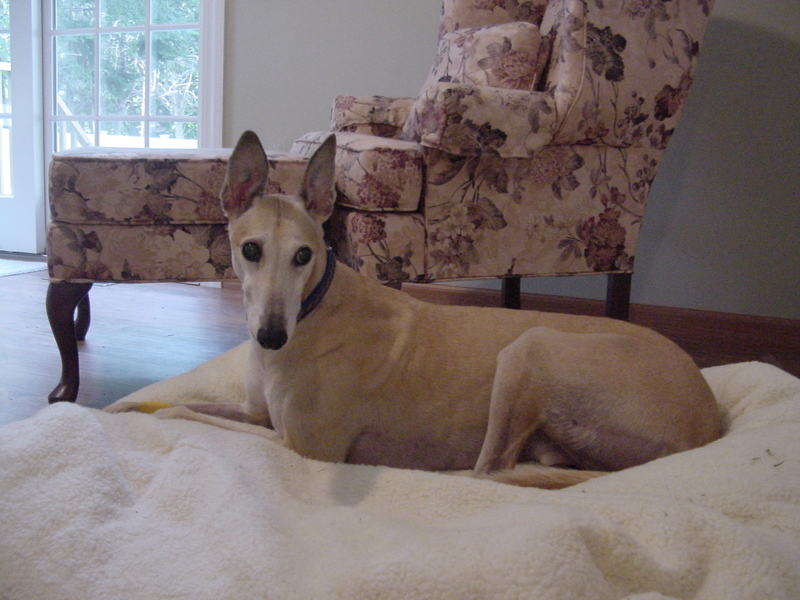 Casey loved going on walks and enjoyed visits with her many greyhound friends, and her favorite thing was reclining on "her" couch and drinking tea in the morning. We are so grateful that she found her forever home and the love she so deserved.